One gift definitely stands out and that is the silk scarf. What is so great about a scarf? Well! For one, it is made from silk, which is a luxury that every woman desires and very few are able to fulfill. 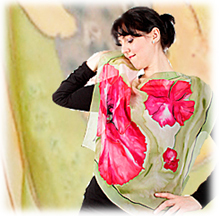 Second, these are no ordinary scarves; they are hand painted silk scarves. Talking of painting, if you haven’t seen a painting from the eyes of a woman, then you have really missed something and this is a fact. Coming back to the silk scarves, each one is hand painted and each one tells a story. Some paintings tell the story of the coming winter and the snowy landscape, while the other one tells the story of spring and autumn and bees and flowers. Each story contains an element of modern art and has been accentuated with generous sprinklings of colors. Attractiveness: The silk scarves for women ooze ounces of attractiveness. Versatility: These scarves can be worn in different weather and climates and any time of the day or night. Occasion: Wearing silk in itself is an occasion! You don’t need any occasion to wear these beautiful scarves. Better still, they can be worn on any occasion or event, including Christmas. They are perfect Christmas gifts for women. Thinking about picking one up for your wife? Style: The smoothness of silk ensures that you can sport any style you want. 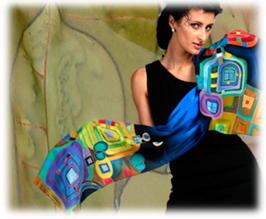 You can even choose different paintings or artworks on the scarves for sporting a particular style. You can sport everything, from an Ascot Knot to criss-cross neck wrap, western neck wrap, stock tie, slip knot, rosette turban, shoulder wrap, bow neck wrap, Hollywood knot, and much more. Use: You don’t have to necessarily wear it as a scarf. You can even sport it as a head cover, a waist strap, or an accessory with your skirt.